Anger is a terrible trait. I was blessed to be raised by parents who seldom if ever argued. Tension was not a part of our household ambiance. But I did know people who argued constantly. There were the tenants who lived above us in our three-story house in Mt. Vernon, New York. Every day I could hear the hollering between husband and wife, parent and child. As I kid, I didn’t know what to make of it except that it was not pleasant to listen to. When I was courting my wife in the 1960’s, we occasionally double-dated with another couple, who were constantly arguing with one another. They eventually married. At the time, I was shocked since the arguing never seemed to stop. Someone always had to be right and the other wrong. Divorce came several years later and it did not surprise me at all. The stirring 42, the story of black baseball player Jackie Robinson is a classic illustration of successful anger management, controlling one’s emotions in the face of extreme provocation. Branch Rickey, President and General Manager of the Brooklyn Dodgers, wanted to bring African-American players into major league baseball. To accomplish this, he offered a contract to Jackie Robinson, who would become the first black to break the baseball color barrier. The film describes Robinson’s year with the Montreal Royals, the Brooklyn farm team, in 1946 and his rookie year, 1947, with the Brooklyn Dodgers, as they fought for the National League Pennant. Racism at that time was very much part of the country’s landscape. Subjected to taunts from adults and children, who followed the bigoted example of their elders, Robinson endured much abuse. He knew it would happen. Rickey, before employing him, informed him of the controversy that his hiring would generate. Moreover, Rickey told him that to be a success, he would have to control his temper. Robinson realized the historic nature of his employment and agreed to Rickey’s terms. Not only did some of the fans express racist rants to Jackie, but some of the players and managers did as well. In one particular game, the manager of an opposing team used racist epithets to unsettle him, but Jackie responded by hitting successfully, stealing a base, and scoring the winning run. Although some of Jackie’s own teammates were unenthusiastic about his joining the team, most supported him and championed his participation in the game. In one very touching moment, Pee Wee Reese, the team’s shortstop, demonstrates his support of Robinson in a public way before a hostile crowd in Cincinnati, earning the kudos of Branch Rickey, the one responsible for bringing Robinson into the organization. The Ethics of the Fathers, a seminal work on Jewish ethics, defines the hero, the truly strong person, as one who can control his impulses. Strength in the Jewish view is not manifested in physical terms by muscle size or possessing a large body. Rather it is defined by character, an inward quality. Because we are all tested every day by irksome comments from business associates, acquaintances, friends and family, Jewish tradition encourages us to control our anger in order to reach our own potential as a holy people. Every day in my private prayers, I pray to God to help me control my reactions to provocations. As a teacher, I am tested in the classroom. I know that an inappropriate response to a child’s problematic behavior can hurt me and the child for a long time afterward. Words are like arrows and cannot be retrieved once released. Therefore, I have to think deeply before responding. 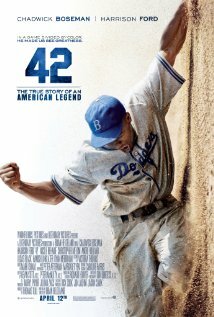 42, in its depiction of the remarkable strength of character of Jackie Robinson, serves as an object lesson in restraint that demonstrates true strength. Good review. It was by-the-numbers, but it worked because its heart was clearly in the right place. And also because Ford was so very good.